I’m stupidly proud of this book, and I think that if any of my works is remembered 100 years from now, it will probably be this one. NOMINATED FOR A NEBULA AWARD. 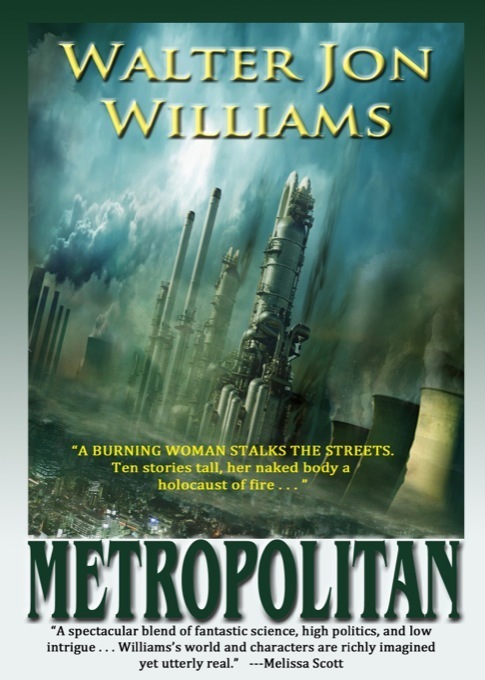 Walter Jon Williams’ classic science fantasy Metropolitan is once again available for a new generation of readers. Aiah has fought her way from poverty and discovered a limitless source of plasm, the mysterious substance that powers the world-city. Her discovery soon involves her with Constantine, the charismatic, dangerous, seductive revolutionary who plans to overthrow, not simply the government, but the cosmic order . . .
“Entertaining . . . Williams understands that science fiction can breathe life into language . . . [His] writing is always lean, lively and engaging. To paraphrase a certain French guard, I’ve already got one. Apropos your last two posts — how would Aristoi work as an e-book or an audiobook? Would it? Does it? I agree: it’s a great novel that stands up today. Thanks, Walter. I have a physical copy, and just purchased this as an electronic backup. I recall reading this and the undeservedly obscure City on Fire many years ago at the MIT SF library. The universe was intriguingly unconventional and for some reason I have a vivid memory of some sort of anthropomorphic (plasm emanations?) Sun and Moon at the end of city on fire. Reminded me vaguely of Ptolemaic crystal spheres or Greg Egan’s solar system, sealed off by aliens when humans were unwittingly forcing the rest of the universe’s quantum superpositions to collapse by observation. Best of luck with the Patreon, I will certainly contribute! I love Metropolitan and anyone who doesn’t have it should definitely jump in and buy now. Mastadge, Aristoi has been available as an ebook for some years now. I had to rewrite some sections, because the two-column format doesn’t worn in ebook formats. It isn’t a audio book yet, and would pose some obvious challenges to the reader and producer. It would be kind of cool to have different voice actors, talking over each other. Too bad you could not do it with sound coming from the left speaker for the main text and the right for the voices. I still think TINAG is your finest novel. I’d like to see that one as a movie, especially the Indonesia part.